The Roztocze is a long range of picturesque hills of up to about 300 m in height, situated in south-eastern Poland, close to Zamosc. Formerly a part of the huge estate of the aristocratic Zamoyski family, it is a region abundant in natural attractions and historical sights, interesting for hikers and anyone who wishes to discover these mysterious eastern hills. Some of the region is protected as part of a nature park, known as the Roztocze National Park. Besides this, there are 10 other reserves and many natural monuments in the neighbourhood. Most of the park is forested, cut through by the River Wieprz and numerous, steep-sided loess ravines. If you had to choose just one thing from the ample wildlife, then it is likely you would choose the Polish horse, which has been reintroduced in the park. 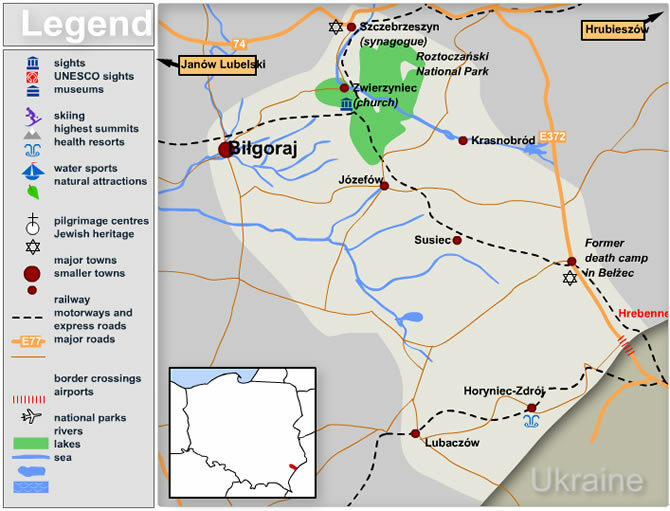 Located near the boundary with Ukraine, the Roztocze is typical borderland country; with traces of the many cultures formerly found here, each sharing the same turbulent history. In the Roztocze, you can see Ukrainian Orthodox churches, mysterious Jewish synagogues and old cemeteries, as well as the former residences of the Polish gentry. The main town of the area is Zamosc, where you can find rail connections to Warsaw and Krakow, although the trains are not frequent. You can try getting there via Lublin, a significant city to the north of the Roztocze, and then taking a bus or train to Zamosc, Zwierzyniec, Szczebrzeszyn or one of the other towns of the Roztocze region. Private transport is undoubtedly more convenient. From Warsaw you can get to Lublin, Zwierzyniec or Tomaszow Lubelski taking road 17. If starting in Krakow, head east along the E40 to Rzeszow, and then turn in onto one of smaller roads leading to the various nooks of the Roztocze.